Bus loading for the B.A.A. shuttles to the Athletes’ Village in Hopkinton takes place on Charles Street between the Public Garden and Boston Common. Buses will be loaded according to the wave to which you have been assigned. 6:00 a.m. to 6:45 a.m. 7:00 a.m. to 7:45 a.m. 8:00 a.m. to 8:45 a.m. 8:55 a.m. to 9:30 a.m. In order to load all the buses efficiently, avoid delays, and get to the start on time, we strongly recommend you load the buses at your designated time. Transportation to the start is for official participants only. We are not able to provide transportation to the start from Boston for family and friends. Each participant must show his/her bib number upon boarding the buses. Athletes registered in an Para Athletes Division or Program should refer Para Athletes Race Weekend for information related to accessible transportation to the start. Participants who wish to check gear on race morning must do so PRIOR to boarding the buses in Boston. On-street parking in Boston's Back Bay is extremely limited during race week. There are a number of parking garages in the area. Public transportation is strongly encouraged. Please note that certain parking garages within Boston are inaccessible on race day. 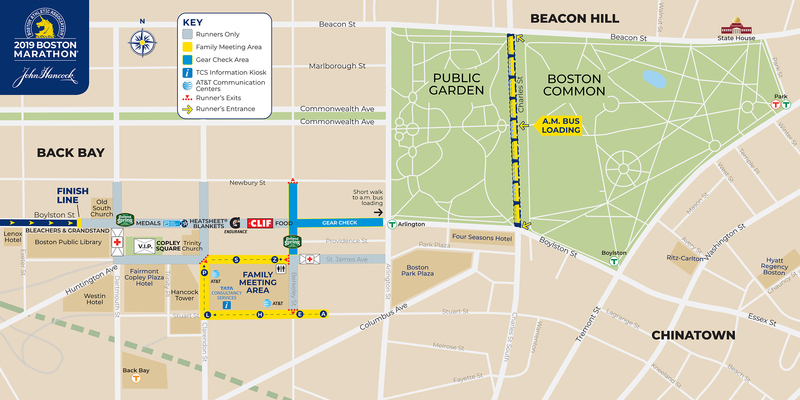 The entrance to the Boston Common Garage will close at approximately 2:00 a.m. on race day and will not re-open until 11:00 a.m. on race morning. Parking in Hopkinton is extremely limited and security measures may slow access from the parking areas for spectators and runners. Roads within the town of Hopkinton close by 7:00 a.m. and no street parking will be available. Limited parking is available at the South Street lot (52 South Street, Hopkinton, MA) - which is outside of the 7:00 a.m road closure area - and volunteer/spectator parking at the Hopkinton State Park on Route 85. Shuttles from the South Street lot will take registered entrants directly to the Athletes' Village. Hopkinton State Park parking and shuttle service is for volunteers and spectators only. Registered entrants parking at this location and using this shuttle will not be transported to the Athletes’ Village and will have to walk an additional one mile from the drop-off point to the Village. These runners may be subject to additional security screening to enter the Village. Registered entrants are requested to use the shuttle buses from the South Street parking lots in order to ensure timely arrival at the Athletes’ Village. Directions from Boston to South Street parking lot: Massachusetts Turnpike (I-90) to Route 495 South to exit 21B. Also take exit 21B if coming from Route 495 North. From Boston and all other directions to the Hopkinton State Park: Massachusetts Turnpike (I-90) to Route 9 (exit 12). Follow Route 9 West to Route 85 South. Shuttles will begin taking participants from the South Street parking lot (52 South Street, Hopkinton, MA) to the Athletes' Village beginning at 6:00 a.m. through 11:00 a.m. on race morning (after 11:00 a.m., buses will run from South St. to Main St. - two blocks from the start line). Shuttles from the South Street parking to the Athletes' Village run every 10 minutes or as filled. Shuttle service from Hopkinton State Park begins as early as 5:00 a.m. on race day. Registered entrants should use the shuttle buses from the South Street parking lots in order to ensure timely arrival at the Athletes’ Village. Entrants who choose to park at Hopkinton State Park will be shuttled to downtown Hopkinton, and will have to walk up to a mile to the Athletes' Village entrance. Beginning at 1:00 p.m. on race day, return bus service to Hopkinton will commence. Buses will line up along Stanhope Street at the corner of Clarendon Street. Return bus service is for official entrants only. You must show your bib to board buses to Hopkinton. Buses will make stops at Hopkinton State Park and South Street parking lot (52 South Street, Hopkinton, MA). Return bus service to Hopkinton will conclude at 7:00 p.m. on race day.